Mamounia Lounge Knightsbridge, bar and restaurant, is situated across the road from Harrods on Brompton Road and offers a chic Middle Eastern drinking and dining experience. The key behind Mamounia Lounge is its plush décor. Lavishly decorated with gold and red drapings, Arabic motifs and exotic Middle Eastern cushions, Mamounia Lounge has a sense of the opulent to it. Gracing the entrance to Mamounia Lounge is an outdoor shisha lounge which morphs into a dining area. This leads into the bar/lounge, and beyond this is a more formal dining area that backs onto the open kitchen. 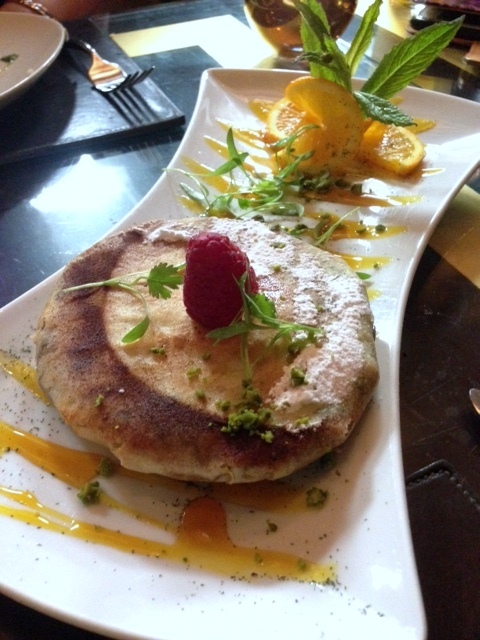 Mamounia serves a comprehensive Lebanese and Moroccan menu. But make no mistake. Mamounia Lounge is very much about the ‘lounge’ experience. It feels very much like the kind of venue where you go for drinks and have food to go with the drinks. That said the food was very good. A starter sized pastilla of chicken (£9.50) wrapped with filo pastry was really delicious. Freshly baked, the pastry was crispy and the chicken filling was moist with a hint of almond nuttiness to it. The pastilla was finished with a dash of icing sugar and some cinnamon, both of which added a touch of fragrant sweetness to the pastilla. The Rivea London Restaurant at the Bulgari Hotel in Knightsbridge draws its inspiration from the vibrant food markets of the Italian and French Riviera. Therefore what you see on the table is a blend of French and Italian dishes drawn up from the freshest seasonal produce. Executive Chef Alexandre Nicolas worked with Michelin-starred Alain Ducasse both in London and Paris for ten years. As such, he brings a touch of refinement to a menu that focuses on simple, yet bold flavours. We booked the ‘Star Deal’ menu at Rivea London through Bookatable.co.uk which comprised of four plates and a glass of wine for a very reasonable £35 per person. The starter selection offers a varied choice of six options, and accordingly we each chose different dishes and were able to try four items. The Star Deal menu is very much designed for sharing, as is the a la carte menu, which is something that I love to be able to do. 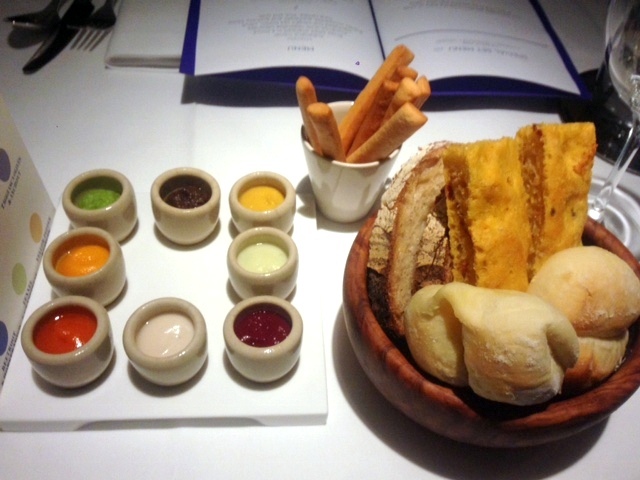 We began the meal with a selection of breads (lemon, focaccia and sourdough) accompanied by a tasty selection of nine, mostly vegetarian dips such as beetroot and horseradish and pumpkin and nutmeg. 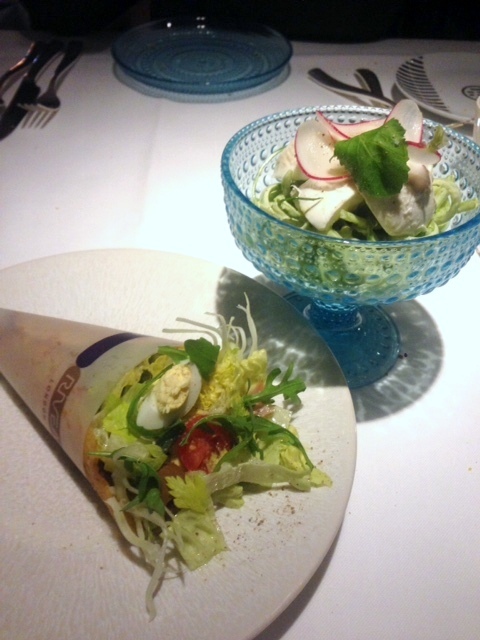 This was a really colourful way to start the evening before we moved onto the glorious starters. The ‘Rivea’ niçoise salad wrapped in a socca (a thin chickpea flour pancake which originates from Nice) was one of the best niçoise salads I have ever tasted. All the ingredients were delicious, but it was the dressing that set the dish alight, as it was lovely and delicate, and it showed off an incredibly skillful touch. Also well conceived was the mozzarella with puntarella (chicory). 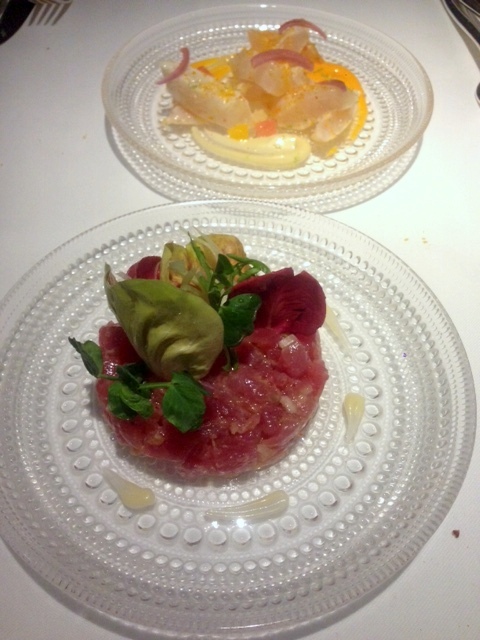 A tuna tartare was also wonderful, boasting of precisely cut pieces of tasty tuna which had been lovingly marinated. We also enjoyed the marinated line-caught sea bream with citrus. The sea bream was delicious and the accompanying citrus dressing proved to an eclectic pairing. The dressing was rich and creamy, and perhaps a little overpowering against the fish, but overall the dish very tasty. We thought both of our main courses to be delicious if a little small in size. The scallops with accompaniments of Jerusalem artichoke puree, pieces of pancetta and hazelnuts proved to be a fabulous dish, abounding with lots of umami flavour. The scallops were perfectly cooked with a nice caramelisation, the puree was delightfully creamy, and the pancetta and hazelnuts added another dimension to the dish. The second main of veal fillet was a simple dish, yet nicely executed. 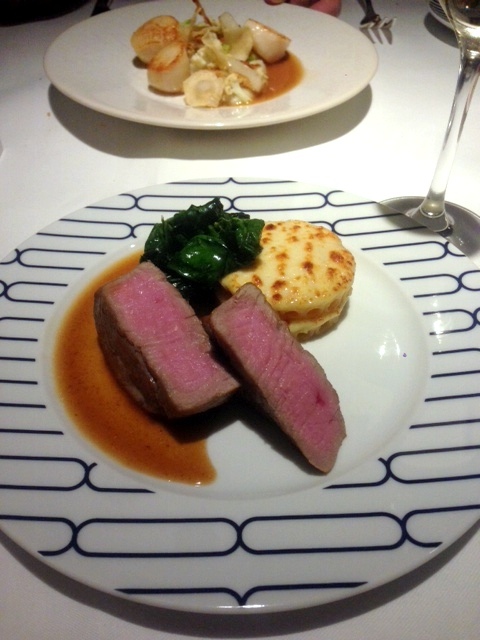 The veal was tender and paired warmly with some potato gratin and spinach. To finish off the dish was a lovely, flavoursome veal jus. 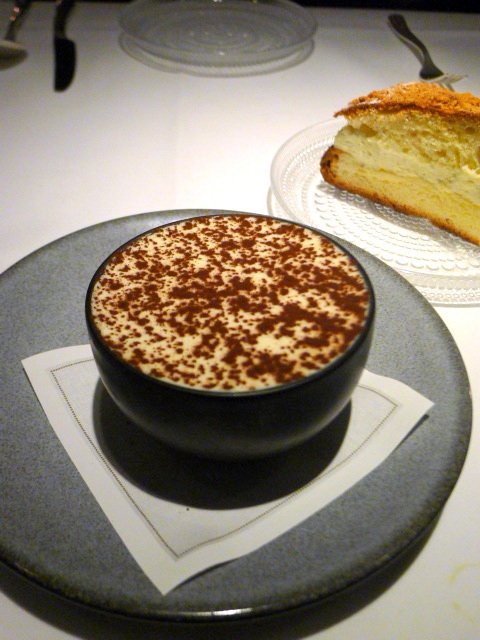 Moving onto the desserts and we found the tiramisu to be somewhat of a disappointment. It was bland, with too much cream and not enough coffee or vanilla flavour. The house dessert of a ‘St Tropez’ cake, a brioche sponge with orange blossom and sandwiched with a vanilla marscapone cream faired better and was more enjoyable with its light, airy texture and delicious creamy filling. The ‘Star Deal’ set menu at Rivea London put on an impressive display of cooking talent and wonderful produce. Everything that we ate and the house wine that came with the set menu demonstrated quality. Furthermore, we were also charmed by the extremely professional and welcoming service. To round off the experience, Rivea London made for a truly glamorous venue. The décor was wonderfully stylish with a chic ambience, yet it did not overwhelm the diner so as to still maintain a sense of relaxed elegance. 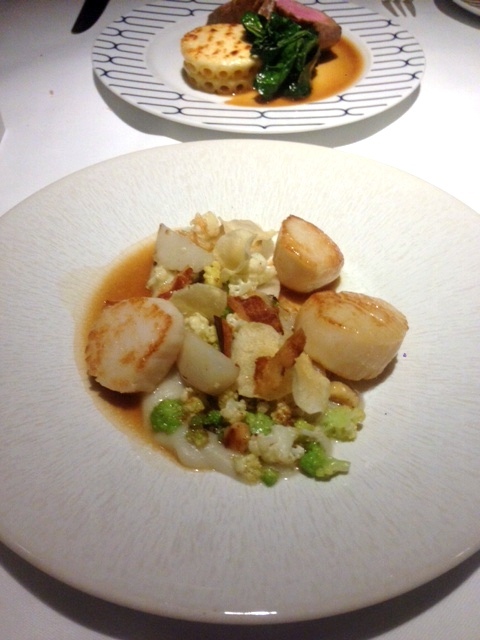 At £35, the ‘Star Deal’ at Rivea London proved to be really great value for money. I was really impressed and I would go again. 1) The niçoise salad wrapped in a socca. 7) The great value star deal menu. Price: The ‘Star deal’ menu on Bookatable.co.uk is £35 and includes one glass of wine. Excludes other drinks and service. The Rabbit in Chelsea is the second venture by the Gladwin brothers who brought us The Shed in Notting Hill. I adored the food at The Shed, the fabulous restaurant founded on fresh, foraged and farm-reared sustainable principles by the brothers Richard, Oliver and Gregory, and Rabbit is no different. Richard went into hospitality, Oliver is a chef and Gregory is a farmer; and the three have therefore managed to form a perfect triangle of what it takes to produce a winning restaurant. The interior at Rabbit also has a touch of country to it and is wonderfully rustic with reclaimed British furniture being a key feature at the restaurant. As with its sister restaurant The Shed, The Rabbit is supplied with reared livestock and wines from the family farm and vineyard in Sussex which is run by Farmer Gregory. Known as Nutbourne, references are often made to ingredients from Nutbourne in the menu. Other seasonal produce come from local Sussex suppliers. Head Chef Oliver Gladwin previously trained at Oxo Tower, Launceston Place, Just St James and with Hugh Fearnley-Whittingstall at River Cottage. His passion for foraging and seasonality is evident in his daily changing menu, which is divided into distinct sections: mouthfuls, slow cooking and fast cooking. The menu is designed for sharing with Rabbit recommending about 4-5 plates for two to share. 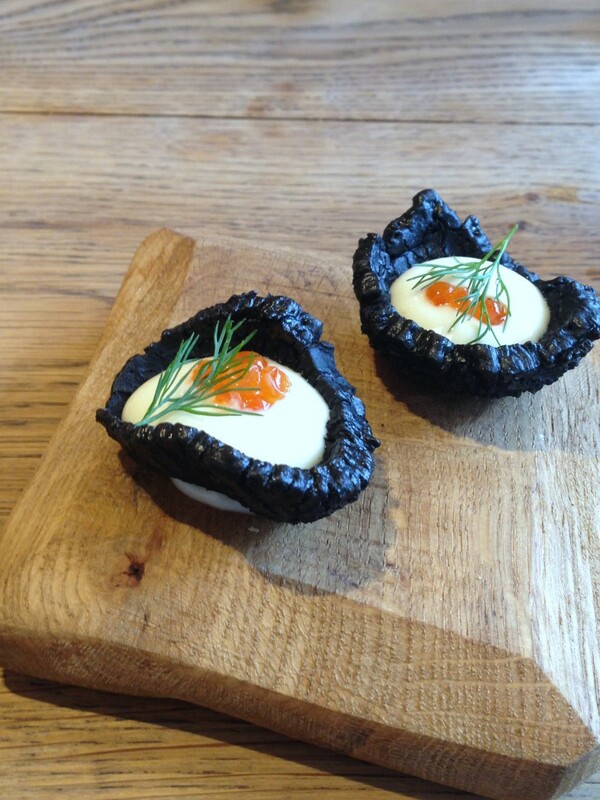 We began our meal with one of the ‘mouthfuls’, a squid ink cracker filled with sea bass roe and dill (£1.50) that was really tasty. The cracker was crunchy, the squid ink flavour in the cracker was delicately poised, the mellow saltiness of the filling worked well with the cracker and the dill added great fragrance.